The Patriots came to play in prime time. Although it wasn't a perfect night and things looked squirrelly for a time, the Pats did what champions do. They took over in the fourth quarter. Much credit is due to the Patriots defense. They allowed just 17 points to an Aaron Rodgers-led Packers offense with nearly a full arsenal of weapons. That should've been more than enough for Tom Brady and the offense to do enough to earn the win, and they sure did that. Overall, an excellent performance for the Patriots against a talented but inferior team. Here are some quick-hit thoughts on a fun night in Foxborough. Big-time fourth-quarter drives on both sides of the ball swing the game. Starting with Lawrence Guy's forced fumble that Stephon Gilmore recovered, the Patriots finally got their stuff together and put together a pair of championship drives on both sides of the ball. Julian Edelman's double-pass to James White helped spur the go-ahead touchdown, which the Patriots defense followed up with a stop that included a third-down sack for Trey Flowers and Adrian Clayborn. And the Patriots followed that up with Josh Gordon's 55-yard touchdown that really put the Patriots in the driver's seat. Patriots pass rush comes to play. Flowers and Clayborn's sack felt like the final reward for a strong night up front for the Patriots' defensive front. 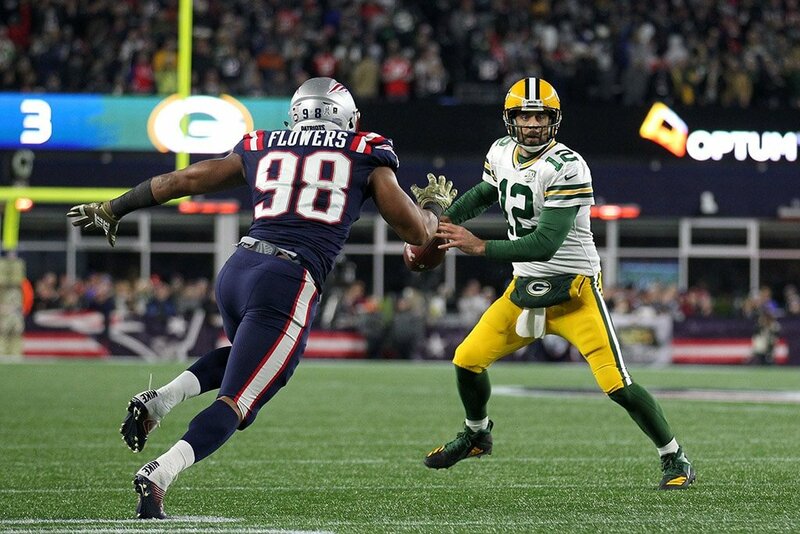 Aaron Rodgers was able to escape their pressure and make plays, but the Patriots had him scrambling for much of the night and forced a fair amount of errant throws. Making Rodgers uncomfortable was going to be paramount to slowing the Packers down, and the Pats sure pulled that off with aplomb. At the end of the day, 17 points allowed to that quarterback - and zero in the final 26:18 of the game - is a superlative effort. Cordarrelle Patterson actually shows improvement as a running back. Bet you thought the Patriots were just screwing around against the Bills, huh. Patterson carried the ball 11 times for 61 yards and a touchdown, and his score came at a crucial point in the game with the score tied near the end of the second half and a Packers double-score attempt looming. One week after everyone said "WTF? ", Patterson looked like - dare I say - an actual NFL running back. Patriots dust off the Julian Edelman double-pass on huge fourth-quarter drive. Long time coming for Edelman, who last completed a double-pass in the 2014 AFC Divisional Playoff against the Ravens. This time, he goes across the field to James White, who takes it 37 yards and almost into the end zone. White finished off the championship drive for the Patriots to reward Josh McDaniels' trickery and Edelman's clutch passing. More postgame coverage coming up later tonight and Monday on 985TheSportsHub.com.